Galaxy ZEGA: A Virtual Tank Battle Game In Real-Life | Nerd Much? The new trend towards augmented reality toys is exciting, isn’t it? With toys like the Anki Overdrive and Hot Wheels A.I. (good in theory, not in execution, for the record), having a physical car to drive around while you’re playing a video game of sorts is so much more satisfying than just booting up an old Twisted Metal game. 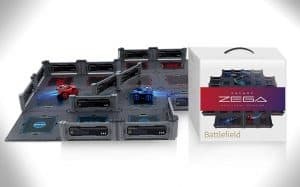 Aside from Anki and Hot Wheels, there still aren’t a ton of similar ideas that blend real-world interaction with a virtual game, but one of our new favorites has to be Galaxy ZEGA. Galaxy ZEGA is a real-world game that sees two tanks battling it out on a configurable track (although you can drive the cars on any surface). Each tank has its perks and stats, complete with advantages and disadvantages. For example, the red tank (named Leo) is beefy on defense, but does less damage when compared to the blue tank (Gondar). Players connect their respective tank to their smartphone with Bluetooth. Once connected, players will choose from two different games: Battle Mode (where the goal is to “shoot’ the opposing tank), or Capture the Flag (where players simply have to drive over specific tiles to win). While that sounds super simple, it’s not all there is to Galaxy ZEGA. What makes the game so much fun is the 30 unique power-ups and skills that players will randomly find while in the heat of battle. You’ll also earn gold along the way that can be used to upgrade attack, defense, and speed, as well as special abilities that can be used in battle. For example, players can purchase Star Guard, which will make them immune to damage for 20 seconds, allowing them to attack their foes with invincibility for a short period of time. There’s also Attack Mist, which blocks the attack button on the opposing user’s screen so that they can’t see it. There are numerous buffs and debuffs, and each one has a different effect on the gameplay. 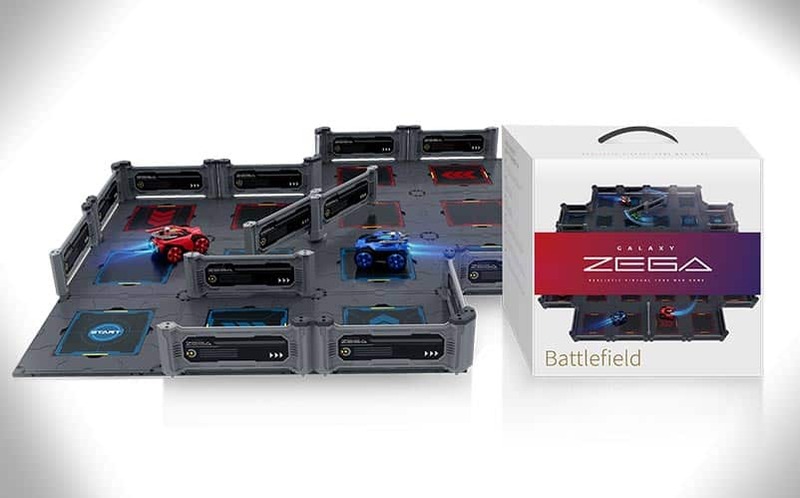 You can preorder the Galaxy Zega Starter Kit at the official site for $149.99, with extra cars sold separately.